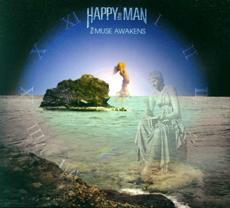 George Graham Reviews Happy the Man's "The Muse Awakens"
Most rock fans have their favorite "obscure but memorable" bands, groups that released one or two outstanding albums, and then broke up or otherwise departed from the scene before enjoying any significant commercial success. Most of the time, those bands are gone forever, due to the changing life circumstances of the various members, leaving only their recordings in their wake. With rock nostalgia in vogue and the incessant repetition of old so-called "classic rock" on commercial radio, a number of former bands -- usually the commercially successful ones -- have reunited with varying artistic results, with some showing how wise it was to have broken up in the first place. Once in a while one of those obscure but memorable groups will have a go at getting back together. There's usually a lot less commercial pressure to come up with something to keep the geezer-rock crowd happy and buying, and the results can be worthwhile. One of my all-time favorite "obscure but memorable" bands was Happy the Man, an art rock band from the Washington, DC, area which existed in the mid to late 1970s. Now I have been a fan of art rock or progressive rock since the early days of the Nice, and the Moody Blues first orchestral forays, into the period that gave us Yes, Emerson Lake & Palmer, and Genesis. All the big-name art tock bands were British, but my pick for the best of the genre was all-American Happy the Man, from the nation's capital, no less. Some would make fun of the pretense of rock trying to achieve symphonic scale, with elaborate compositions and sophisticated arrangements, borrowing as they sometimes did from classical music. And by the mid 1970s, some of those bands did achieve a level of bombast, with apparent competitions for who would require the greatest number of semi-trucks to carry their huge stage setups. They were perhaps one reason for the appearance of the punks, who were determined to cast that all aside. But Happy the Man concentrated on the music, shunned the pretense, and were mostly an instrumental group, specializing in compositions that combined complexity with a melodic sense. After forming over a period of time with changing personnel in the early to mid 1970s, they gradually achieved recognition, eventually being signed to Arista Records by none other than pop music maven Clive Davis, and being produced by Ken Scott, whose credits ran from the Mahavishnu Orchestra to David Bowie. They released only two formal albums as a band, but those recordings have been held in virtual reverence by most of the art rock fans who had an opportunity to hear them. Of course, a sophisticated band who played mostly instrumental music was doomed on a major label and the commercial media, especially in the period when punk and new wave were emerging. So after recording some demos for a third album, Happy the Man broke up in 1979, with the various members pursuing other interests, including carpentry, in the case of one of the members. Keyboard man Kit Watkins toured with the British band Camel for a while, and one of the early drummers played in a group that would eventually become The Cars. Watkins remained active making his own music, and eventually releasing the band's final demo recording as an LP called Better Late. Over the years, there were attempts at reuniting Happy the Man, whose following remained devoted. But with their members were scattered in California, on the East Coast and in Hawaii, that was difficult. Eventually, all the members came to live on the East Coast, and in 2000, a reunion performance, minus Kit Watkins, was held in Bethlehem, PA, at the Northeast Art Rock festival. I had an opportunity to see that show, and the band proved to be in top form, after more than two decades apart. Now, more than four years after that reunion, Happy the Man have finally released a new recording. It's called, perhaps appropriately The Muse Awakens, and for long-time Happy the Man fans, it's worth the wait, and with art rock continuing to chug along as a kind of cult phenomenon, finding newer, younger audiences, the band could find a new generation of fans for their very classy music. This incarnation of Happy the Man includes three of five members who appeared on their 1970s albums, Frank Wyatt on sax and keyboards, Stanley Whitaker on guitar and the rare vocals, and bassist Rick Kennell, who was a founder of the group. Their lead keyboard man is David Rosenthal, who played with the group in their 2000 reunion performance. Rosenthal joined when Kit Watkins declined to go on the road touring. The drummer for this CD is Joe Bergamini, who continues the tradition of having a different drummer on every Happy the Man recording. For those who remember the now classic HTM LPs, the band takes up almost exactly where it left off. The music continues with its multi-layered sound, with lots of interesting twists and complex rhythms, but with ethereal interludes. The band doesn't go for exhibitionist musicianship, but concentrates on the orchestration and ensemble playing, with the focus being on the compositions. David Rosenthal is a worthy replacement for Kit Watkins. He obviously has studied Watkins work, in the manner of his playing, keyboard sounds, and even composing. And the material is a nice cross section of the band's multi-faceted style. If there is any artistic weakness, it is that the band has not moved much beyond where they were in 1979. Many of the familiar elements are there. In fact, the band's fans can probably pick specific pieces from their previous albums that inspired music on the new CD. Not that it's much of a reason to complain, given the wealth of great ideas that were contained in their previous releases. It has been more than a quarter century since the last actual new Happy the Man recording was made. One of the most brilliant progressive rock bands of its day is in fine form in this reincarnation. Their music is elaborate, multi-faceted, sometimes quirky, but always approachable and frequently very attractive. Parts of it could appeal to those who enjoy new age, while other parts could find an audience among jam band fans. Their musicianship is first rate, and their compositions have lost nothing in the intervening 25 years. However, it must be said that they have not gained much in the period, either. Their new CD relies mostly on the band's trademark stylistic touches, as creative as they are. Some tracks on The Muse Awakens sound like composites of ingredients taken from their 1970s albums. There's nothing wrong with continuing one's style, especially when there's so much to it. It will likely bring joy to the band's long time fans, waiting since the Carter Administration for a new recording, and perhaps introduce a new generation of art rock fans to this fine band. Our grade for sound quality is an "A." The CD is well recorded and mixed throughout. There's a nice balance between clarity and an atmospherics, and the dynamic range is decent. It's not often that a band that developed such a reputation after only two official albums should reunite after 25 years. Happy are the fans of Happy the Man. They have brought their distinctive and memorable sound back to life, and they treat it with great authenticity. Let's hope that they can continue their association and perhaps next time, start blazing some new musical trails.